I baked for the first time with my beloved bacon. How many of you are completely grossed out right now? Because I plan on continuing. Sure, in theory bacon in baked goods sounds incredible. Up until now, I just couldn’t go through with it. I was afraid it would taste terrible, and then all my bacon fantasies would be ruined. What if it was like Lindsay Lohan and Grey Goose? Perfectly fine when apart, but add the two together and you just get a hot mess. Or like my sausage thighs encased in straight-legged jeans? Again – manageable alone, disaster when combined. If bacon and baked goods didn’t work out, I didn’t know if I could bear it. Luckily, within minutes of tasting the batter I knew I had made the right choice. 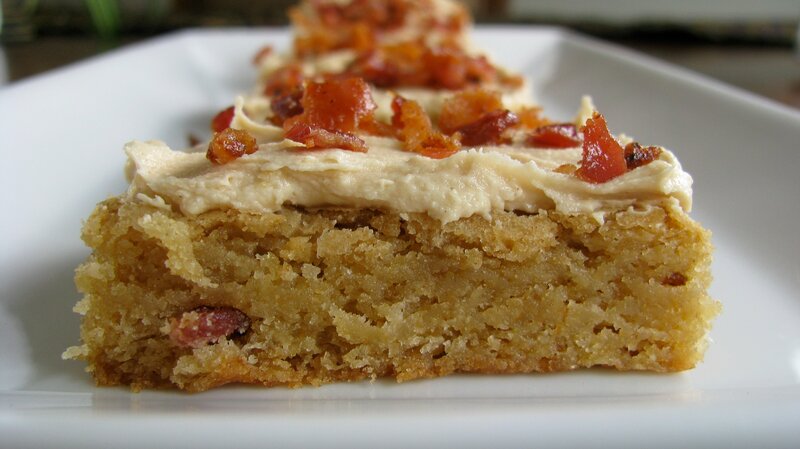 I couldn’t just stop at sweet, chewy blondies swirled with bacon. I topped them with an inch of fluffy peanut butter frosting, sprinkling on more crispy bacon. I honestly thought I was going to die and go to heaven. Given my obsession with ‘sweet and salty’ lately, these fit the bill perfectly. And they made Mr. How Sweet want to vomit. There is nothing more disgusting to him that bacon mixed in cookies or cake. Which meant that I had an entire 9 x 13 pan to eat by my lonesome. Don’t ask me what came over me. When I bake for just the two of us, I tend to 1/2 or even 1/4 a recipe so we don’t have mountains of baked goods to eat. But for some reason, I decided to double the recipe in this case. I couldn’t help myself. I wanted thick blondies. In a large bowl, whisk together sugar and melted butter until smooth. Add in eggs and vanilla. Combine dry ingredients together, and whisk into the batter. Fold in bacon. Spread evenly in an 9 x 13 pan. Bake for 30-35 minutes, or until done. Cream butter and peanut butter. Add sugar gradually. Add vanilla. Add milk 1 tablespoon at a time until desired consistency is reached. More liquid may be needed depending on how thick or creamy you want the frosting. Frost blondies, then top with crumbled bacon. I have a feeling this is not a good thing. I’ve broken the seal. I’ve opened the dam.